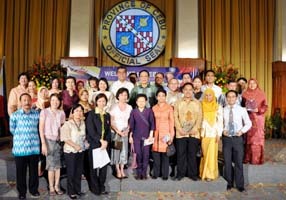 The Republic of the Philippines, through its Department of Education, will host the two annual conferences of Southeast Asian education ministers – the 45th SEAMEO Council Conference (SEAMEC) and 5th ASEAN Meeting of Ministers of Education (ASED) on 26-29 January 2010 at the Shangri-la Hotel, Cebu, the Philippines. 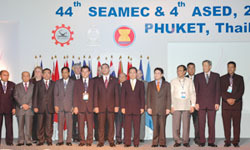 More than 200 participants from 19 countries – comprising education ministers, high-level government education officials, and representatives from international organizations – from the eleven SEAMEO Member States, Associate Members, Affiliate Members, and partners are expected to attend the Conferences. 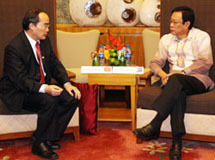 Philippine President H E Gloria Macapagal Arroyo will grace the Opening Ceremony as the Guest of Honor on 27 January 2010. 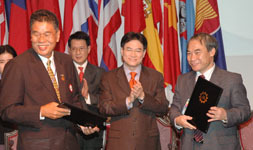 The back-to-back conferences aim to foster stronger cooperation on education among Southeast Asian countries and beyond. High on the agenda are the ten collaborative projects of the SEAMEO Member States that aim at providing education to the underserved communities in the region, integration of climate change in the school curriculum, harmonization of higher education in Southeast Asia, building capacity on maximizing the use of language in teaching, integration of ICT in teaching and learning, and strengthening visibility of SEAMEO, among others. Delegates are requested to collect their name badges at the Registration Desk and Check-In Counter located at Jasmine Room of Shangri-la' Mactan Resort and Spa, Mactan, Cebu. Name badges must be worn and be visible at all times. These badges are required for entry into all venues and meeting areas. Transportation will be provided for all delegates upon arrival and departure, and for all official functions. The 5th ASEAN Education Ministers Meeting will be held back-to-back with this Conference.